PRAY IT DOESN’T HAPPEN TO YOU! 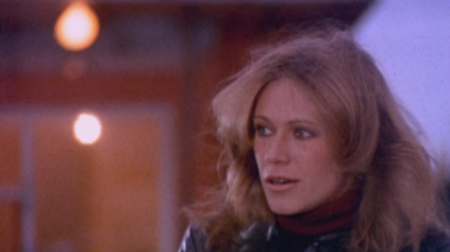 Arrow Video is thrilled to announce the release of David Cronenberg’s much lauded horror classic Rabid (1977) which will be available on dual format Blu-ray & DVD both as an amaray and Steelbook from 16th February 2015. 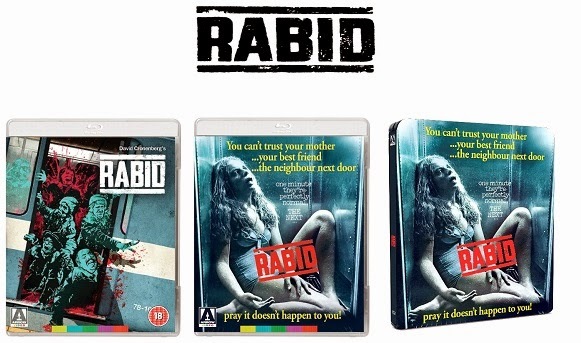 This new edition will mark the Blu-ray world premiere for Rabid, which served as the follow up picture to Cronenberg’s debut 1975 feature Shivers, continuing to explore the themes of viral diseases, yet upping the ante, the scale, the gore levels and the threat by unleashing the venereal terror on the whole of downtown Montreal. This fresh release will include a host of exciting extra features including audio commentaries with both director David Cronenberg and William Beard, author of The Artist as Monster: The Cinema of David Cronenberg. This disc will also feature brand new interviews, most notably with famed director (and Rabid executive producer) Ivan Reitman (Ghostbusters, Twins) and his co-producer Don Carmody. Other extras include the featurette Make-up Memories in which make-up artist Joe Blasco recalls how the film’s various gruesome effects were achieved and Raw, Rough and Rabid: The Lacerating Legacy of Cinépix - a featurette which looks back at the early years of the celebrated Canadian production company. Alongside this, the disc will also include the David Cronenberg episode of The Directors, a 1999 documentary on the filmmaker, containing interviews with Cronenberg, Marilyn Chambers, Deborah Harry, Michael Ironside, Peter Weller and others. First come the Shivers… then, you turn RABID! Celebrated Canadian cult auteur David Cronenberg (The Fly, Videodrome) followed up his startling debut feature length proper Shivers with this tense and gory thriller which expands upon the venereal disease theme of that film, this time unleashing it on the whole of downtown Montreal – with terrifying consequences. When beautiful Rose (adult film star Marilyn Chambers) is badly injured in a motorcycle crash, Dr. Keloid, who is in the process of developing a revolutionary new type of skin-graft, seizes the opportunity to test out his as yet unproven methods. The surgery appears successful and Rose seems restored to full health. But all is not as it should be – Rose has been transformed into a contagious blood-sucker, endowed with a bizarre, needle-like protrusion in her armpit with which she drains the blood from those unfortunate enough to be in her vicinity. An important landmark in the early career of Cronenberg, Rabid sees the director returning to the viral theme of his earlier work but on a much larger (and more assured) scale – where the infection has shifted from the confines of a single apartment block to the expansive shopping centres and motorways of Canada’s second largest city.